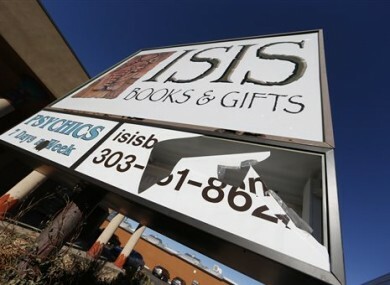 A BOOKSHOP IN Colorado has repeatedly been vandalised because of its name: Isis. The Denver-based shop has been vandalised five times in the last year, but the owners refuse to change the name. Isis Books & Gifts is named after the Egyptian goddess of healing and motherhood and it has nothing to do with the terrorist organisation, the so-called Islamic State – often abbreviated to Isis or Isil. Co-owner Jeff Harrison said that the shop has been vandalised five times in the past year or so, probably by people who mistake the name for Isis. The latest vandalism came last weekend when a store sign was smashed after the terrorist attacks in Paris. The shop sells books and gifts related to spirituality, religion and healing. “Isis is the name of an Egyptian goddess, 3,500 years old at least, the goddess of women and healing and childbirth — basically the antithesis of everything the terrorists are about,” he said. Harrison suspects the vandals are “some ignorant people believing that somehow the terrorists have a store, a gift store, in the middle of Denver, Colorado”. Harrison hasn’t filed a police report. He and his wife, Karen, have learned to put up with vandalism over the years, he said. The store has been around since 1980 under the Isis name. The Harrisons have owned it since 1997. Harrison said he has heard from other businesses with “Isis” in their names, asking if they planned to change. He tells them no. “For now, we are definitely sticking with the name,” he said. The store has not suffered from the name confusion.”Business has been fine. Actually on the uptick,” Harrison said. Email “Isis bookshop vandalised for fifth time, still refuses to change name”. Feedback on “Isis bookshop vandalised for fifth time, still refuses to change name”.